Home DIY Projects	Gift Wrapping Station – Throwback Thursday! Greetings! Happy Thursday! 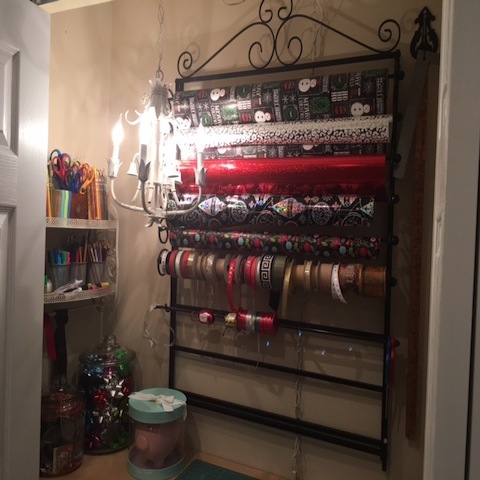 This past Christmas I treated myself to a gift wrapping station in our basement. We already had a work surface carved out of a closet but I wanted to make it more functional and organized. I looked online (of course!) and found this great wrapping paper holder. It can be wall-mounted ]or it can stand alone. Under the 6th bar were 2 hooks, so I added a black tension rod to hold more ribbon and this one is much easier to switch out empty rolls since you don’t need to unscrew the finials. The scissors fit nicely on the end. I use a razor cutter to cut the paper off of the rolls. Quick, easy and straight! I found several different kinds of glass jars on Amazon to hold my pre-made bows and gift tags. I like to make my own gift tags too (but only if I have enough time). Also, I like to make my own bows, but I have to admit, the closer to Christmas it gets, the lazier my gift wrapping gets, so you can easily tell the progression of gifts by the bow. Early on = meticulously wrapped with curly ribbon, elaborate bows, bits of greenery tucked in. Christmas Eve = premade bow slapped on top. With Christmas well behind me, I need to switch out the holiday paper and ribbon with some birthday and baby wrap. My niece is having a baby girl soon so I see lots of pink paper coming to my wrapping station soon – plus some Adorable DIY Baby-Shower Favors!